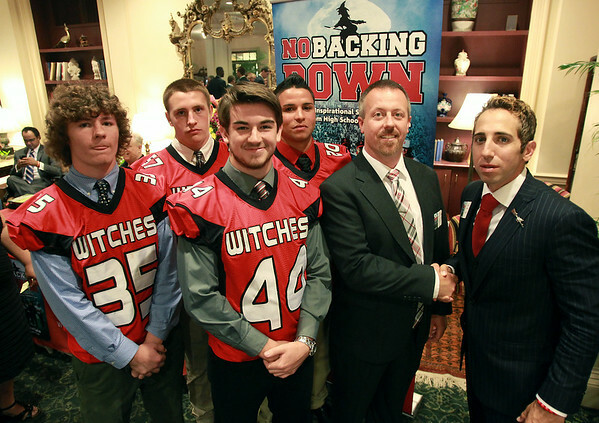 Former Salem High School teammates Sean Stellato, a current NFL Agent, and Matt Bouchard, newly appointed Salem High football head coach right, with the Salem High School fall football captains Victor Claudio, Joey Byors, Glen Gard, and Genrri Rosario, at a gala and book signing for Stellato's new book "No Backing Down" a book on the 1994 Salem High School Super Bowl football team. DAVID LE/Staff photo. 7/11/14.